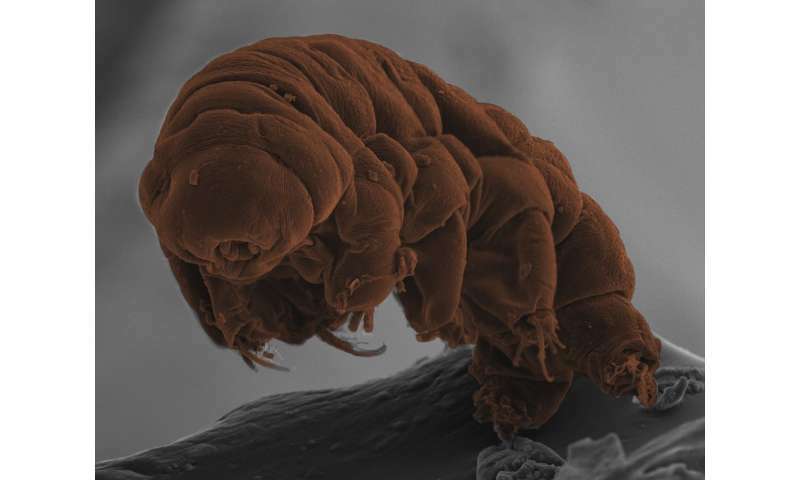 New genome sequences shed light on both the origins of the tardigrades (also known as water bears or moss piglets), and the genes that underlie their extraordinary ability to survive in extreme conditions. A team of researchers led by Mark Blaxter and Kazuharu Arakawa from the universities of Edinburgh, Scotland and Keio, Japan respectively, have carefully stitched together the DNA code for two tardigrade species, and their results are presented in an article publishing 27 July in the open access journal PLOS Biology. Tardigrades are microscopic animals, justly famous for their amazing ability to withstand complete dehydration, resurrecting years later when water is again available. Once desiccated, they have been frozen in ice, exposed to radiation, sent into space vacuum... and still they spring back to life. Tardigrades became more famous recently when it was suggested that their DNA was a mix of animal and bacterial segments, making them "Frankenstein" hybrids. The new research has now laid the Frankenstein idea to rest by arguing that tardigrade DNA looks "normal," with no evidence that these special animals use extraordinary means to survive. Previous ideas that they might have taken up large numbers of foreign genes from bacteria are shown to be due simply to contamination. But what is "normal" to a tardigrade is still enigmatic and exciting. At less than a millimetre in length, tardigrades are too small to leave fossils, but using the new genomes, the scientists were able to explore what the DNA could tell them about where tardigrades sit in the tree of animal life. Tardigrades are a distinct type of animal whose closest relatives are arthropods (insects, spiders and their allies) and nematodes (roundworms). But which is closest? While the accepted view is that their four pairs of stubby legs make them more closely related to arthropods, the DNA evidence surprisingly strongly favoured a closer kinship with nematodes. The researchers then looked at a set of genes—the so-called HOX genes—used to lay down the nose-to-tail pattern in embryos. There are usually about ten different HOX genes in animals, each involved with a different part of the nose-to-tail pattern. They found that tardigrades were missing five HOX genes, and that most nematodes also were missing the same five genes. This is either a coincidence or further evidence that tardigrades and nematodes are closely related. It was also possible to identify the genes that tardigrades use to resist the adverse effects of desiccation. By asking which genes were turned on during the drying process, scientists could identify sets of proteins that appear to replace the water that their cells lose, helping to preserve the microscopic structure until water is available again. Other proteins look like they protect the tardigrades' DNA from damage, and may explain why they can survive radiation. "I have been fascinated by these tiny, endearing animals for two decades. It is wonderful to finally have their true genomes, and to begin to understand them. It has also been great to work with Kazuharu Arakawa and his Japanese colleagues on this - science is truly global, and together we achieved exciting things," Professor Mark Blaxter said. "This is just the start - with the DNA blueprint we can now find out how tardigrades resist extremes, and perhaps use their special proteins in biotechnology and medical applications."